Pricing strategies specify market needs that may be served by different price offerings. The pricing strategies of the company are duly related to market strategies that eventually come to dominate both the overall strategy and the spirit of the company. Pricing strategies deal with matters such as number and diversity of products, product innovations, product scope, and product design. The implementation of pricing strategies requires cooperation among different groups including finance, research and development, the corporate staff, and marketing. 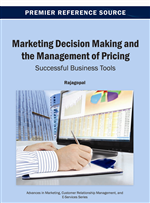 This chapter guides managers as to how to manage the concept pricing process for new product development effectively by the customer centric companies through mapping the consumer perceptions about their needs and expected products. In this chapter, the author describes how companies get customer centric pricing strategy, product pricing, and tactical moves in a way that help the firms to get the competitive advantage and build profits in the future. Many companies consider the process of new product development as colossal due to organizational and market led intricacies. However the process of new product development can be made easier by rationally dividing it into two parts- an early stage, which focuses on evaluating prospects and eliminating bad bets, and a late stage that optimizes the market potential. Firms should consider pricing new products in reference to their close substitutes available in the market. The new products need to be re-priced over their life cycle to fit the changing competitive environment. At the onset of price determination process for new products, firms must estimate demand, decide on market targets, design promotional strategies, and choose distribution channels. It is important to make decision between a high initial price, which takes advantage of inelastic demand and helps the firm bear the burden of financing, and a low initial price, which can penetrate mass markets early and raise entry barriers to competitors. Firms need to reduce the prices when it enters into its mature stage in order to prevent the entry of private-label competitors (Dean, 1976). Eli Lilly, following this approach, designed and piloted Chorus, an autonomous unit dedicated solely to the early stage. Chorus has significantly improved efficiency of new product development and productivity at Lilly. Although the unit absorbs just one-tenth of Lilly's investment in early-stage development, it delivers a substantially greater fraction of the molecules slated for late second phase trials at almost twice the speed and less than a third of the cost of the standard process, sometimes shaving as much as two years off the usual development time (Bonabeau et al, 2008). The pricing process to be followed by the firms for new products is exhibited in Figure 1. Determining price for new products is faced as a major challenge faced by most emerging firms. In a competitive marketplace often new products have short lifecycle due to myopic pricing strategies. At the onset of determining price of new products, firms should review their attributes and complimentary association with the existing products, consumer need for the new products, and innovation led consumer values as illustrated in Figure 1. The cost of technology and economic viability of the new products also need to be assessed by the firms in order to fix an appropriate price. Most firms depend on the projections of the market performance of new products and decide the concept price based on the use value of the product. Firms may also measure the offtake (volume of sales) of new product at the initial price announced, and develop effective customer relations strategies to support the price decision.